#APMS Entrance Test 2019 /AP Model Schools Entrance Test 2019 Notification for 6th Class AP Model School Admissions- AP Model Schools Admission Test 2019 Notification -APMS CET 2019: The Commissioner and School Education Department officials has released the AP Model School Entrance Test 2019 Notification in the month of January 2019 for admission into VI class in Model Schools in AP for the academic year 2019-2020. The C and DSE AP invites the online applications from the eligible students for appearing the AP Model Schools Admission Test 2019, which will be conducted as per their announced schedule. 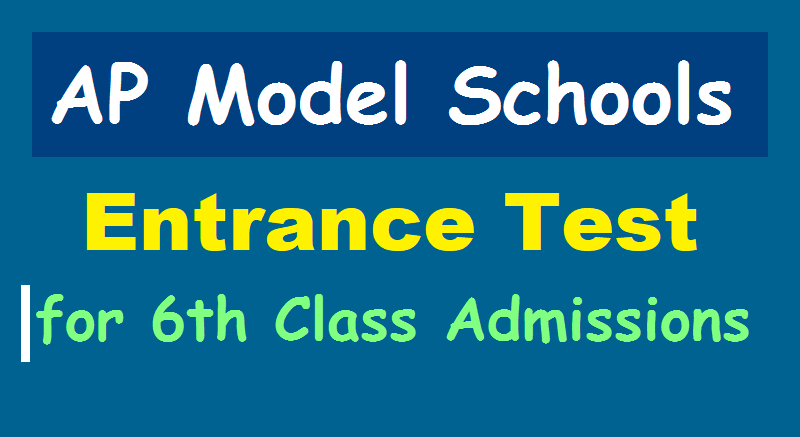 AP Model Schools Entrance Test 2019 Schedule, Eligibility Criteria, Selection Procedure, How to Apply, Online Application Form, Exam Date, Last date for apply and guidelines details are given below..
AP MODEL SCHOOLS (English Medium) లో 6వ తరగతి కొరకు ప్రవేశ పరీక్ష. ● Online లో దరఖాస్తు చేయు తేదీ 10-01-2019 నుండి 20-02-2019. ● మెరిట్ లిస్ట్ ప్రకటన: 11-04-2019. #About: The Model Schools Scheme is meant for catering to the needs of Educationally Backward Mandals to provide Quality Education on Kendriya Vidyalaya template. The Government of India sanctioned Model Schools to Andhra Pradesh (AP Model Schools Admissions 2019) and these schools were established in Educationally Backward Mandals. Model School Concept is basically a Model School will have infrastructure and facilities of the same standard as in Kendriya Vidyalayas and with stipulations on pupil-teacher ratio, ICT usage, holistic educational environment, appropriate curriculum and emphasis on output and outcome. The medium of instructions in model schools totally in English. Model Schools were the brain child of Union Government and were set up in the most back ward mandals of the district. All the students who domicile from the mandal or studied in the particular mandal in any recognized institution are excursively eligible for admission into the Model Schools. As per the new guidelines contain in GO.Ms.No.22,Dated:29.04.2016 and Procedure contain in GO.Ms.No.17,Dated:11.02.2013 Model Schools in the State invites applications from the eligible students, those who were passed V class are eligible for applying for VI class into model schools for this academic year and those who were passed VI, VII and VIII classes are eligible for applying for VII, VIII and IX (Vacant Seats) classes into Model Schools. These admissions made into English medium. - Students studying in Telugu / English Medium are eligible to appear for the Entrance Test. - Parental Income should not exceed Rupees One Lakh per annum. - The candidates can apply to any AP Model School of the district for which he / she belongs. 1. For 6th Class: SC / ST students should have born between 01.09.2005 to 31.08.2009 and OC / BC / SC-Converted Christians (BC-C) should have born between 01.09.2007 to 31.08.2009. 2. For 7th Class: SC / ST students should have born between 01.09.2004 to 31.08.2008 and OC / BC / SC-Converted Christians (BC-C) should have born between 01.09.2006 to 31.08.2008. 3. For 8th Class: SC / ST students should have born between 01.09.2003 to 31.08.2007 and OC / BC / SC-Converted Christians (BC-C) should have born between 01.09.2005 to 31.08.2007. 3. For 9th Class: SC / ST students should have born between 01.09.2002 to 31.08.2006 and OC / BC / SC-Converted Christians (BC-C) should have born between 01.09.2004 to 31.08.2006. Admission for classes VI to X shall be done as per the procedure followed by APREIS. While doing this, the candidates from the same Mandal where Model School is functioning, will be given preference. Admissions will be done on the basis of a written test/ entrance test.